I wouldn't have believed a spoof of Star Trek could be this funny and this exciting, both at the same time. 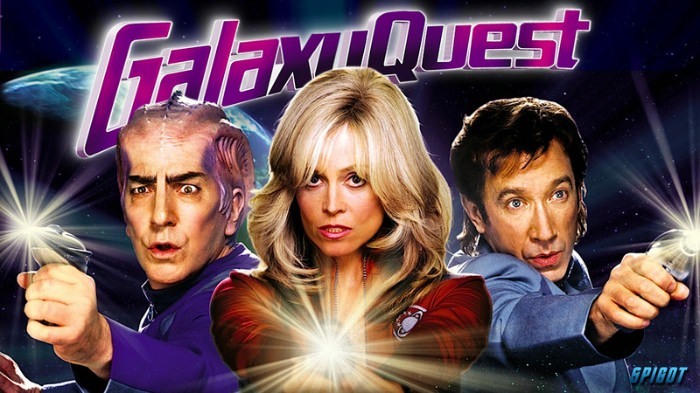 Knowing that the soap opera conflicts between the stars of the fictional series were based on the real life drama between Shatner and his costars really gives life to this wonderful combination of comedy, action, and science fiction. Harold Ramis was slated to direct this movie but he quit. Here's what Wikipedia says. Ramis was hired in November 1998, but departed in February 1999 due to casting difficulties. He wanted Alec Baldwin for the lead role, who turned it down. Steve Martin and Kevin Kline were considered, though Kline turned it down due to family reasons. Ramis did not agree with the casting of Tim Allen as Jason Nesmith, and Dean Parisot took over as director within three weeks. After seeing the film, Ramis said he was ultimately impressed with Allen's performance. 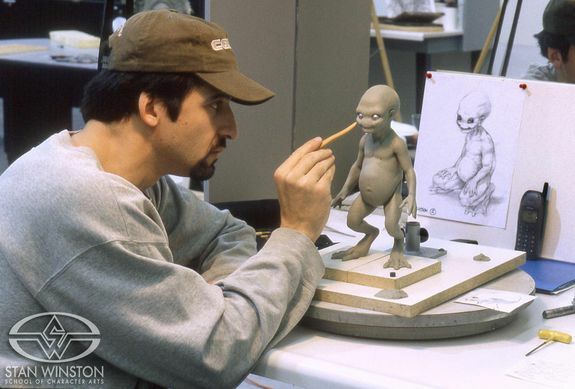 The aliens were created by the Stan Winston Studio from designs by Crash McCreery, Chris Swift, Brom, Bernie Wrightson, and Simon Bisley. 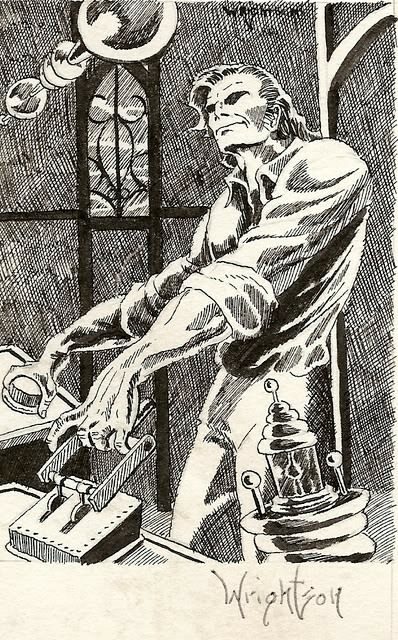 Wrightson is the amazing artist famous for a series of Swamp Thing comics and many other fine works. I remember one review of the movie when it came out. 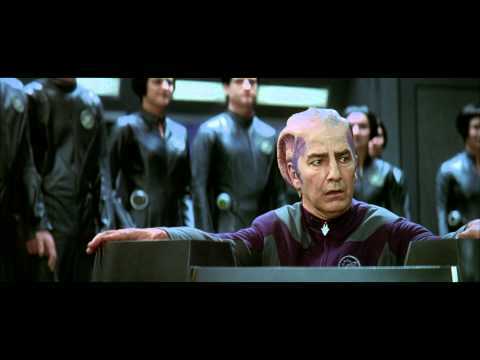 "The best Star Trek movie ever done!". A great movie deserves a great trailer — and this movie has one! Enjoy this YouTube trailer, and then pop in your Blu-ray of this wonderful movie. What? You don't own this movie? Shame on you! Go to your room right now think about what you've done! And just wait 'til your father gets home and I tell him about this! You'll be grounded for a month! Now, Bud, THIS is an homage! Tim Allen said in interviews that he was a definite fan of STAR TREK and this was his way of saying it. This movie was genuinely funny and exciting at the same time. I agree with the comment that it's the BEST STAR TREK movie ever made!! 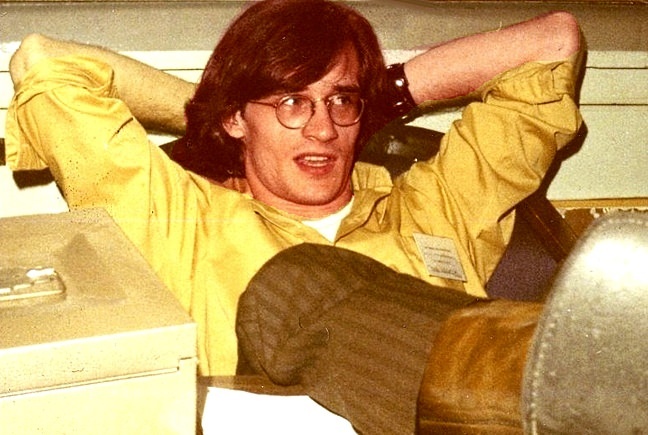 I actually met Bernie Wrightson back in 1967 at the 25th World Science Fiction Convention in New York (at the tender age of 19) when he walked up to Frank Frazetta at a small commemorative luncheon which honored Hal Foster ("Prince Valiant"). After the luncheon, Frazetta started signing autographs for the small group of lucky fans who managed to worm their way into this modest occasion. 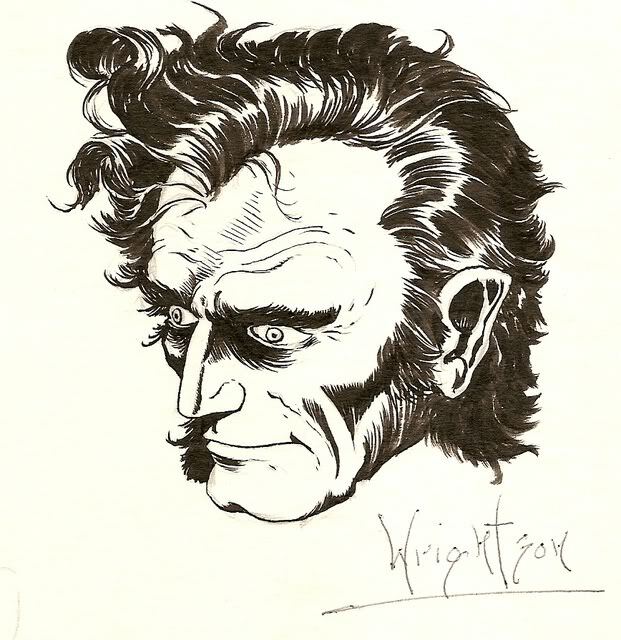 Bernie Wrightson suddenly stepped up to the table and handed Frazetta several examples of his work, including the pen-and-ink drawing shown further down of Victor Frankenstein (the head shot). 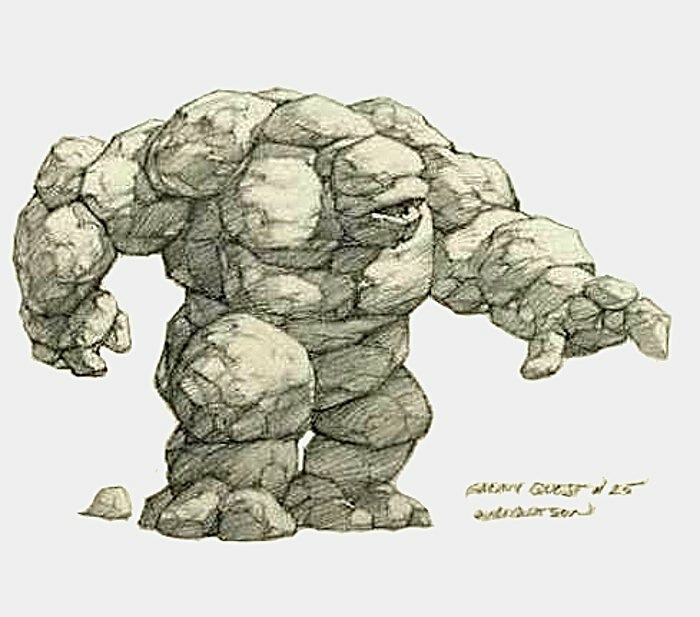 Bernie asked Frazetta what he thought of them. Bernie was born on October 27, 1948, which makes him two months younger than I am. So like me, he was just 19 when he stood there in front of Frank Frazetta signing autographs after the small commemorative luncheon for Hal Foster that my friends and I had managed to get into. And I stood right next to Frazetta when Bernie presented examples of his artwork. Bernie dazzled everybody with his bold attitude and his James Dean appearance. Bernie stood there like a gun fighter about to shoot it out on the streets of Dodge City. He had long hair like in the photo below, wearing blue jeans, high-top sneakers., and a dress shirt that was untucked with the sleeves rolled up. He looked like the leader of New York street gang, ready to rumble. It's no wonder that the macho Frank Frazetta spotted a kindred spirit standing right in front on him. I vividly remember several of Bernie's pieces that Frank looked at carefully while I stood next him, and they were awesome! 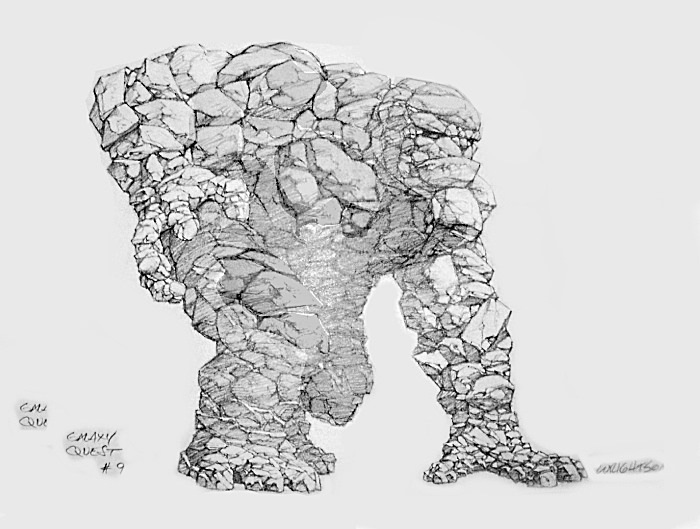 One drawing showed a group of cavemen with a woolly mammoth trapped in a box canyon, while one cavemen posed in the foreground on a rocky ledge, gazing down while his hunters polished off the beast! 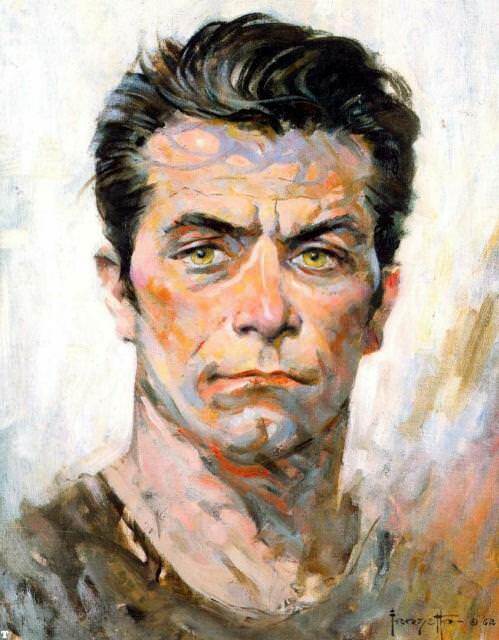 Frazetta actually turned to me at one point (the pimple-faced kid from Atlanta) and commented on the faint pencil-lines visible around the inked lines in the head shot of Bernie's Victor Frankenstein! One of my three friends who had come with me from Atlanta (Don Karr) struck up a conversation with Bernie right after that, and they became friends for several years. Prior to that, Don had been a friend of Jeff Jones back when Jeff lived in Atlanta. Jeff was one of the two guests of honor at Alan Foster's commemorative luncheon, along with Frazetta. That's probably how my friends and I managed to get into the commemorative luncheon, but I don't really remember. Later that same evening Bernie knocked on the door of the hotel room occupied by me and my three friends from Atlanta. He wandered in with a big smile and told us he had spent several hours in private conversation with Frank Frazetta in his own hotel room (where Frank's wife and kids were also staying). Frank gave him helpful advice on how to advance his career as an artist. Bernie was so excited about his sudden fame and recognition that he agreed to sell us some of his work . . . and I got the two pen-and-ink drawings below for $5.00 each! He signed them both with a ball point pen. 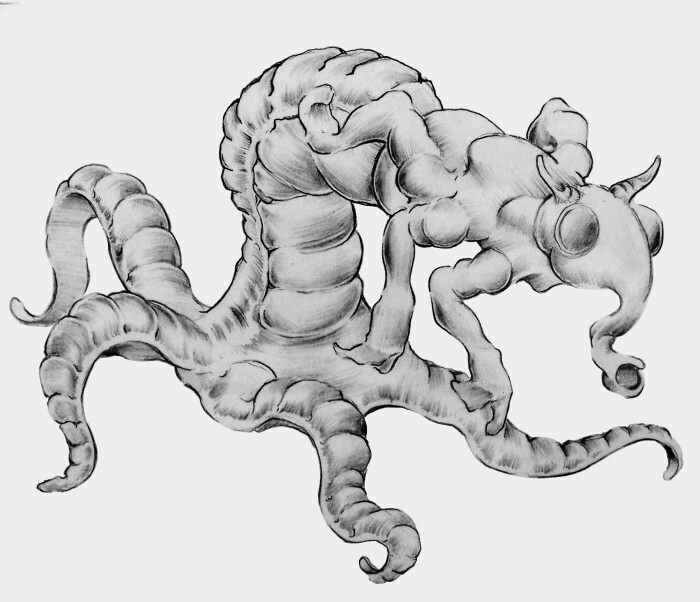 Until today I had no idea that Bernie Wrightson had ever worked in graphite (pencil — my own medium of choice). I read somewhere that Wrightson tried oil painting a few times, but he said he hated it because, " . . . it's like painting with mud!" 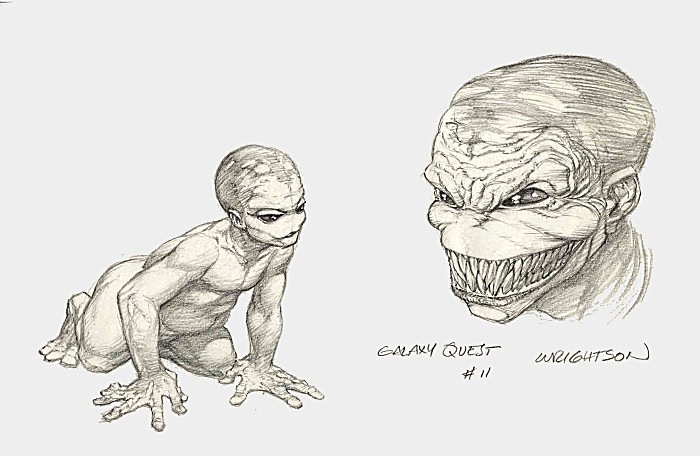 However, the sketches he did for several aliens in Galaxy Quest are graphite drawings, and without undue modesty I think my own efforts to concoct alien creatures using graphite aren't too bad by comparison! — and this one by Bernie. 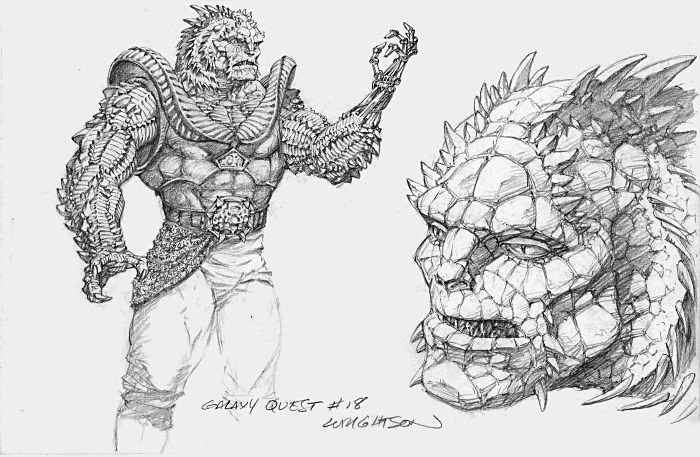 My point, of course, is that I was obviously inspired by my exposure to the work of Bernie Wrightson when he was my age and Frank Frazetta in his prime. 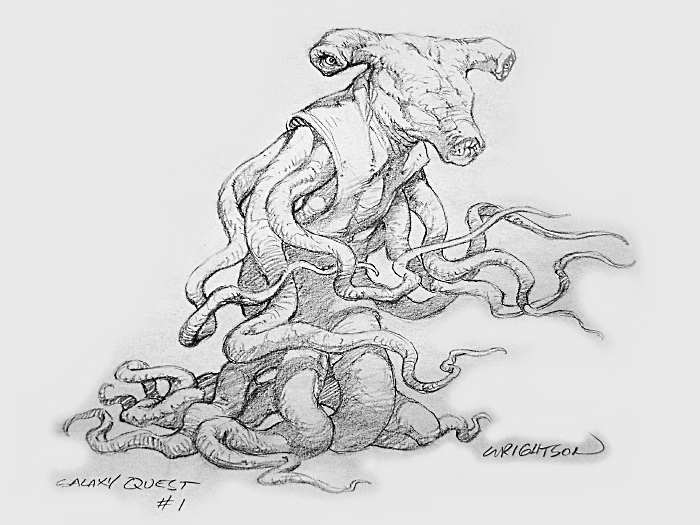 And even though I've never been a professional artist like either of those two legendary masters, I'm glad I can share my own humble efforts with you folks here on All Sci-Fi. 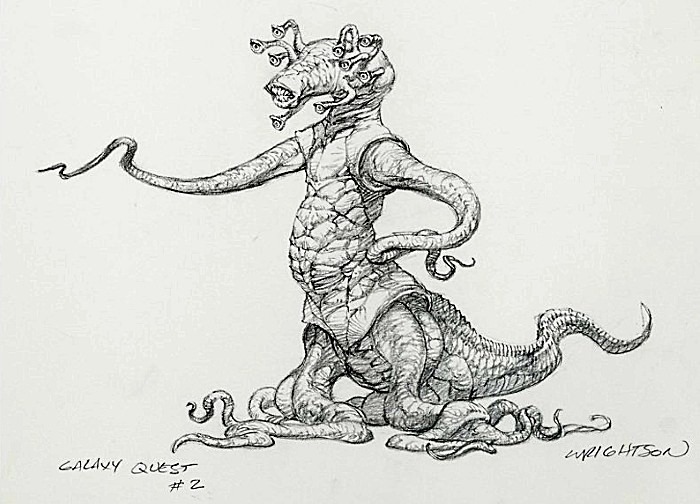 The rest of these alien designs by Wrightson are stunning, demonstrating his amazing ability to render details which add a lot to his great designs. 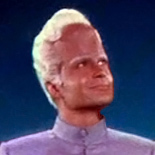 Commander Taggert: Never give up! Never surrender! King Leonidas: Spartans never retreat! Spartans never surrender! "KILL EM' ALL! LET GOD SORT EM' OUT!" You tell us! You started it! I thought it was Baron Von Stuppe who said that, just before diving though a rowboat. At least I started out with a tie-in to the thread topic. Yes, and you know what a stickler I am about THAT!